Along with Whole Wheat Radio last year, another part of my teenage years finally ended last week with the closing of the The J-Walk Blog. 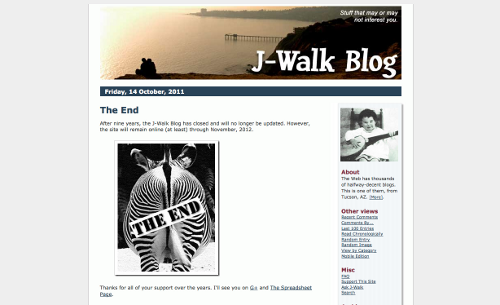 After nine years, the J-Walk Blog has closed and will no longer be updated. However, the site will remain online (at least) through November, 2012. Thanks for all of your support over the years. I’ll see you on G+ and The Spreadsheet Page. I'll be honest, I'm not too sure about his decision to move over to the Google+ silo. Despite his optimistic feedback to people questioning the longevity of the service in his blog comments, we have no idea how long Google+ will last. Unlike his old site, we'll also need to be logged into our Google overlords to leave comments, which will be a pain. Still, as he said, Google+ is easier than blogging, so here's hoping the lower barrier to entry will facilitate further posts from him, albeit in a different form. John appealed to us to not "get all sentimental and mushy", so instead I'll just wish him the best in his next endeavour, and thank him for all the years of entertaining and thought provoking entries on The J-Walk Blog, some of which inspired my own. As stated on his sidebar: The Web has thousands of halfway-decent blogs. This is [no longer] one of them, from Tucson, AZ.